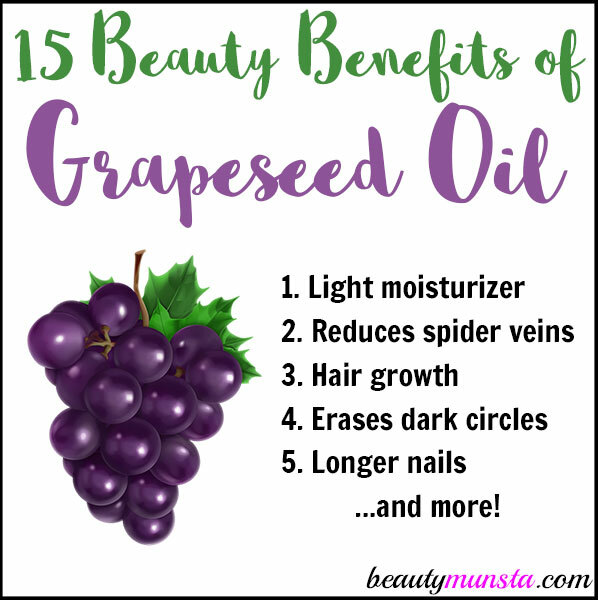 15 Beauty Benefits of Grapeseed Oil for Skin, Hair & More - beautymunsta - free natural beauty hacks and more! 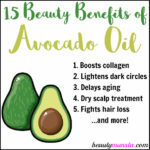 Beautymunsta.com brings you 15 gorgeous beauty benefits of grapeseed oil! 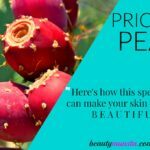 Use this amazing oil for vibrant beauty! Grapeseed oil is a popular vegetable oil. It’s pressed from the seeds of grapes, particularly wine grapes. It’s used for cooking but it also has amazing beauty benefits, as we shall explore below. Refrigerate grapeseed oil to lengthen its shelf life. 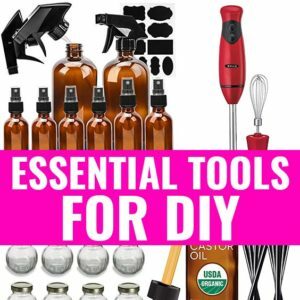 When using it to make your own DIY products, combine it with Vitamin E oil to extend its shelf life. Pregnant women should consult a doctor before using grapeseed oil. Do a patch test by applying a drop of grapeseed oil on your inner arm. If there’s irritation within 1-2 hours, do not use the oil. 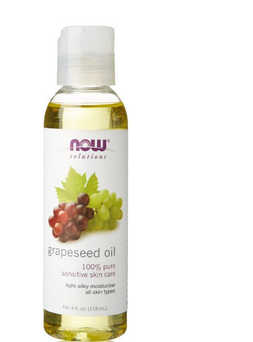 With its thin consistency, grapeseed oil is an amazingly light-weight moisturizer. It is lighter than coconut oil and jojoba oil. So if you’re looking for a non-greasy moisturizer for your skin, choose grapeseed oil! Grapeseed oil is high in linoleic acid, which is said to reduce clogged pores and balance excess oil production! So oily skin folks, grab a bottle of grapeseed oil to stop being a Grease Face! Got fine hair? 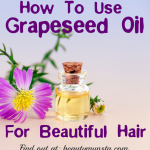 Use grapseed oil has a hair oil/moisturizer! You can apply a few drops on your hair strands before you shampoo your hair to acts as a pre-poo. You can also smooth grapeseed oil on your hair length right after a shower as a leave-in conditioner. Yup! You read that right! Grapeseed oil is good for lightening dark circles and making your under-eye area look young and vibrant. Dab a drop of grapeseed oil with your ring finger (because this finger has the gentlest pressure) under your eyes every night. I have a DIY Dark Circle Eye Cream on the blog. 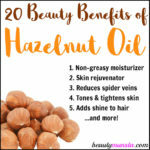 You can replace the almond oil with grapseed oil! Spider veins are tiny non-bulging versions of varicose veins. They can appear anywhere: my friend has tiny ones on her face and I have them on my legs ugh. Thankfully, grapeseed oil has the ability to reduce and hopefully eliminate spider veins. Store an 8 oz amber bottle with grapeseed oil mixed with 15 drops of cypress essential oil. Cypress helps with blood circulation and eliminates spider veins too. Rub this blend all over your body right after the shower, before you towel off. Before you use heat tools on your hair, apply grapeseed oil. It acts as a heat protector so you won’t end up with fried and frizzy looking hair but moisturized and shiny locks instead! If you have thin and fine hair, fill a 4 oz spray bottle with 2 tsp grapeseed oil and distilled water. Spray on your hair before turning up the heat. If you have thick and coarse hair, use the grapeseed oil straight on your locks. Grapeseed oil has a night thin consistency which makes it easily applicable on skin. Use it as a perfect massage oil on its own, mixed with another carrier oil like jojoba oil, or with a few drops of relaxing lavender essential oil to it. Nail Growth Serum: Pour a little grapeseed oil into a 10ml roller bottle. Now add 5 drops myrrh essential oil, 3 drops lemon essential oil and 3 drops geranium essential oil. Push back the roller ball into the bottle, shake well to combine. Roll on your cuticles and nails every night before bed. Since grapeseed oil has a very light consistency, it makes a good summer body oil. During the summer, using light body moisturizers will ensure your skin feels moisturized and smooth without being greasy and icky. Body Oil: In an amber dropper bottle, add ¾ cup of grapeseed oil and 15 drops of any of your favorite essential oils. For a beautiful tan, use sandalwood oil! According to a 1998 study published in the Archives of Dermatology, patients with alopecia were successfully treated using scalp massages which used equal parts of jojoba and grapeseed oils. To this mixture of oils, essential oils of thyme, lavender, cedarwood and rosemary were added. This shows that grapeseed oil has hair growth promoting properties! Hair Growth Blend: In a 4 oz amber glass dropper bottle, add 2 oz of jojoba oil and 2 oz of grapeseed oil. Now add a 1% dilution rate of essential oils which is 24 drops of essential oils: 6 drops rosemary oil, 6 drops cedarwood oil, 6 drops lavender oil and 6 drops thyme oil. Use this hair growth blend to give yourself an invigorating scalp massage every other night before bed. Wash your hair in the morning. You can add a 2% dilution rate which is 48 drops of essential oil, provided you don’t have a sensitive scalp. Use grapeseed oil as part of your oil cleansing blend for healthy supple skin! Oil cleansing might sound contradictory but it’s actually a great way to rid your face of dirt and stale oils. 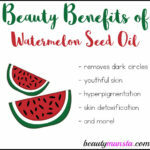 It works because the good oils used help drive out the stale sebum, dissolve dead cells and push out all the impurities from within the skin pores. You can mix ¼ cup of grapeseed oil with ¼ cup of liquid coconut oil and store in a bottle. Use ½ tsp to cleanse your face. Grapeseed oil is good for anti-aging. It helps restore collagen because of it contains OPCs (oligomeric proanthocyanidins). These are compounds that help eradicate free radicals that steal oxygen from healthy skin cells. Grapeseed oil applied to skin promotes the restoration of collagen at the cellular level. Want firmer, more toned and tighter skin? Use grapeseed oil. Its light consistency makes it non-greasy and gives it astringent properties. This makes skin firmer and looking toned. You can use it right after cleansing your face, before moisturizing to act as a gentle, non-drying toner. Since grapeseed oil has a high content of antioxidants, vitamins, protein and linoleic acid, it is good for repairing worn out, damaged and lifeless skin cells. So if your skin looks dull & ashy, you’ve got stretch marks, your skin is sun burned or affected by inflammatory skin conditions like eczema, use grapeseed oil. You can add it to your usual moisturizer or mix it up with liquid coconut oil/shea butter for a nice moisturizer. I like and recommend Now Food’s 100% Pure Grapeseed Oil. It’s probably the most popular brand of grapeseed oil right now. Everyone uses it. You can get an 8 oz bottle or 16 oz bottle.